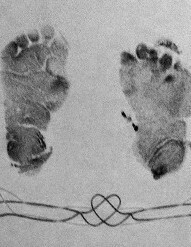 Kiernan Rosalie Hash, aged in the womb 25 weeks, was greeted into her parents' arms at Raleigh General Hospital in Beckley, WV on Saturday, February 2nd, 2019. Within the boundaries of a natural death, she gained her wings to be with our Lord and Savior. Keirnan was the beloved daughter of Gillian Blaine Blackburn and James Robert Hash of Oceana. In addition to her parents, she leaves behind her two-year old brother, Greyson Hash. Also surviving are nine aunts and uncles: Darian Blackburn, Carleigh and Emery Shrewsberry, Cody Danner, Angelique, Victor, and Shawn Hash, Evan Plott, Alicea Fitzwater, and Gabriel Looney; four cousins: Aubreigh, Riley, Callie and Emma Shrewsberry; five grandparents: Melissa and Brian Blackburn of Oceana, James and Sabrina Hash of Alderson, Sue Ellen Brooks of Pineville; and four great-grandparents: Ethel and Roger Day of Glen Fork, Vickie Morgan of Alderson, and Linda Blackburn of Oceana.